Upon completing the Character Creation and the initial dialogue with Robin at the Bus Stop, this is the location you are transported to. Inherited from your grandfather after quitting your job at Joja Corporation, it is your duty to restore the land and make use of it. When creating a new character players can select from a number of different maps for their farm. Each of these maps offer unique benefits, and favor specific skills. The player's farm house will appear the same from the outside on all maps, but begins with a uniquely styled interior after the maps theme. These house interiors offer different furniture pieces, wallpaper and flooring for each map. Each map will change how the farm appears on the game map slightly. Most simply change how the farm area appears, but some change areas outside the farm on the map - the Forest farm extends the forest to the west toward the farm and the Riverland map connects to a river which flows south of the desert. These changes are only reflected on the world map - no changes are made to the actual game world outside the player's farm based on map selection. After selecting a map it cannot be changed, characters are permanently tied to their map type once created. Each map takes up the same area, but there are different amounts of usable, farmable, buildable land on each. The majority of this map is farming land, ideal for crops and animals. The majority of this map is water. Fishing is viable on this farm. 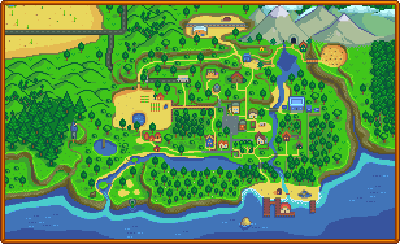 Players can catch the same fish that are found in Pelican Town. Water significantly decreases the amount of farming area. Many trees are found all around the map. Additional cliffs and ponds decrease the overall farming area. The type of nodes that spawn is relative to the player's Mining level. Additional cliffs and a stream decrease the overall farming area. Monsters spawn at night (scales with the player's Combat level). Wilderness Golems are unique to this map. The Farmhouse is the only form of player housing. By default, the house features a TV, a single bed, a picture, a table and chair, decorative dishes, and a fireplace. The farmhouse can be upgraded 3 times, once by paying 10,000g and giving 450 Wood to Robin, and again by paying 50,000g and giving 150 Hardwood to Robin. The final upgrade adds a cellar which can age wine and cheese in Casks, it costs 100,000g. All upgrades takes approximately 2 full days to complete. Upon completion of the marriage ceremony, the person that you married will have a portion of their room moved into the right side of your house. However, this requires at least a tier 2 farmhouse. The shipping box is a rectangular wooden box located to the right of the farmhouse. Items with value can be placed inside the box (excluding tools) and will be sold overnight with the total earnings from selling the items displayed once the player goes to bed for the night. The latest item placed in the box can be recovered, but items placed before the latest item may not be recovered. For example, if the player places 10 corn in, it may be recovered before shipping out for the night, however, if the player places an eggplant on top of the corn, only the eggplant may be recovered, but the corn reaches its inevitable fate of being sold. Seeds for crops can be bought from Pierre in his shop, with his selection correlated to the active season, or obtained from completing Community Center bundles. However, these seeds can only be planted on the farm or in the Greenhouse. 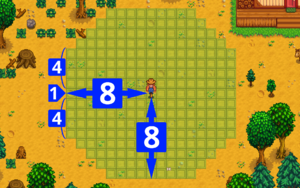 In order to begin the process of growing a crop, the player must find a clear 1x1 area to till with a hoe. Once tilled, the seed may be planted and watered. All crops must be watered daily in order to continue growing. Once a crop is fully grown, it may be harvested. Most crops grow once, and the entire plant is harvested, but for crops like berries and corn, these crops only have their edible portions harvested, allowing the crop to grow back faster than when it was planted. However, once the season for the crop ends, it will wither and die immediately. Fruit Tree seeds can be bought from Pierre's Shop and sowed on the farm in the center of a 3x3 square. All fruit trees take approximately 28 days to mature completely, and, depending on the season, will produce 1 fruit per day. Fruit trees do not produce fruit during winter and are immune to 'risks'. Crows may randomly spawn on the farm each morning there are crops planted. Crows destroy crops by eating them. To avoid this, players may craft Scarecrows and place them within range of growing crops. Collectible Rarecrows can also be used to scare off crows. Buildings can be purchased from Robin in the Carpenter's Shop at varying prices. Farm buildings are required to house animals. Both coops and barn buildings have upgrades, and the base building must be purchased before the upgrade. Each of these buildings can be built multiple times to support more animals. Tip: It's a good idea to build a silo before purchasing animals to place in farm buildings, so there is a place to store hay for them to eat. Farm debris is a naturally regenerating element on The Farm. Creating fences and tilling is an effective method of stopping debris from forming in an area again. It is highly recommended that the player does not prevent all debris from forming again. Placing tree seeds in protected areas will cause the tree to not grow in that area. Apart from Fruit Trees, there are 3 types of common trees that grow in Stardew Valley: Maple Trees, Oak Trees, and Pine Trees. Note: Seeds will not drop until Foraging Skill Level 1 is acquired. Tree seedlings that have not yet grown beyond their first stage will drop nothing. Apart from trees, wooden debris is split into three types, two of which produce Hardwood. The farm's rock debris is not a primary way of farming stone (see The Mines). Stone debris is split into two types, both dropping stone. There are three unique areas on The Farm (not including player placeable buildings, e.g. Barn, The Coop, etc.). The Greenhouse in the beginning is unusable, as the player seems to assume it was destroyed by a storm. Completing the Pantry section of the Community Center will cause the greenhouse to be restored, and be of use to the player. It features a 12x10 plot for crops, and a water trough to refill your Watering can. Any seeds from any season may be planted here, even during the winter, giving the player a large advantage. Buildings may not be placed in the greenhouse. Once your total earnings reaches 25000g, Demetrius meets with you at your door the next day. He states that he is working on research and asks if you wouldn't mind if he used your cave for more. He gives the player the option to either have fruit bats in their cave, or install 6 1x1 plots for growing various types of mushrooms. Picking fruit bats will cause a random fruit (from 4 fruits) to be placed in the cave, while picking mushrooms will cause 5 different types of mushrooms to grow in the cave. Grandpa's Shrine is a landmark located in the northwestern corner of the farm. Upon encountering the shrine, a note is present that reads "Wait for my return at the dawn of the 3rd year". Upon reaching the dawn of the 3rd year, a manifestation of grandpa appears and evaluates your performance. After your third year of being on the farm and his intial evaluation, his shrine will still be active. If you place a Diamond into your Grandpa's Shrine, he will reappear and re-evaluate your farm the next day. He will apologize for being too harsh and promptly give you a new answer if you made some changes. 1.1: Added four new farm maps to character creation, each favoring different skills. This page was last modified on 23 December 2018, at 00:44.